Normally we all make coconut chutney/Tomato /Coriander chutney for upma..But i usually make different sambar.My hubby likes to have upma with sambar more than chutney..Also the juicy sambar when mixed with upma gives a heavenly taste ,…Slurpp!! Even I too love sambar for upma nowadays ..
Soak rice and dal together for 1 hr. Run in the mixie only once (use inch/Juice option)..It should be just broken into two..Set aside..
Heat oil in a cooker base and add the tempering items in the same order.Add only half of the hing during tempering..
Then add the water.Mix well by adding a tsp of oil.Now add the remaining 1/4 tsp of hing and add the rice and dal mixture.Stir it well till the water gets absorbed by the rice,dal mixture..Now close the lid and cook for 1 whistle in low flame. Remove and serve hot with sambar/Chutney!! Hing /Asafetida – 2 pinches. Take a pressure cooker and add the items given under “ingredients”..with salt & water.Soak for 15 mins(this helps the toor dal to cook well N mash).Cook for 2 whistles in low flame..Open and mash it well. Ruoast all the ingredients in a drop of oil & grind it to a fine powder. Add this powder,jaggery after opening the cooker and let it boil well.Temper it and garnish with coriander leaves.. Finally add a tbsp of ghee and mix well or u can temper with ghee..This gives an added flavor to this sambar ! !This is the most important step .Plz dont forget..
U can add any veggies of ur choice to make it healthy..
For upma..Instead of soaking rice and dal for 1 hr,u can directly run it in the mixie once and repeat the same procedure. I should thank EC for posting this yummy sweet just for me..I was elated !! I tried this on sunday evening ..I made some small changes in her recipe..I added grated coconut and instead of grinding the boiled carrots ..i grated them..
Knead the dough by mixing all the ingredients and set aside for 30 mins. In a kadai take the grated coconut along with sugar…Let it mix well and sugar melt..Then add the boiled,grated coconut,ghee,cardamom powder..Stir it well till it forms a ball and becomes non sticky. Remove and set aside.Knead the dough again till it becomes soft. Now make the balls of even size and roll it a little. Place the stuffing in the middle and cover it by pulling all the sides of the dough,,.Make a ball and pat it to a thin chappathi on a greased polythene sheet..
Heat a dosa tawa and cook the poli on both the sides by pouring little oil around it..
Yummy carrot poli is ready to eat..
What a divine platter...love that combo of upma with sambar..Where do you get the Adayar Sambar powder...regular gorcery store? MMmmmmmmm thats yummy platter chitra looks so delicious and comforting .. really wish to have them. I too make toordhal upma but slightly different have a glance at my blog when you find time .. Will try it ur version too dear..
Upma with sambar is such a great combi. Upma with sambar sounds great. Though I have never had this combo, seeing your platter tempts me a lot! wow! slurp! the recipe is so good! I hav never made this upma my self,neither maami makes :( I think its time for me to try of my own! lovely upma and easy chutney! My sis makes this upma and heard a lot about it. It is high time that I try this! Thanks a lot for ur lovely cooments..
Upma looks yummy chitra...this is very new recipe for me. Nice breakfast recipe and its too tempting. :-)..I necer knew that A2B sells sambar powder too..Will buy it sometime..
We also make something similar to this upma...That sambar powder is quite interesting dear..I will buy next time I come to bangalore..
Ur recipe seems very unique. Thanks for sharing it. Usually make sambhar with idli/dosa. This combination looks great. Will make sambhar with upma next time. 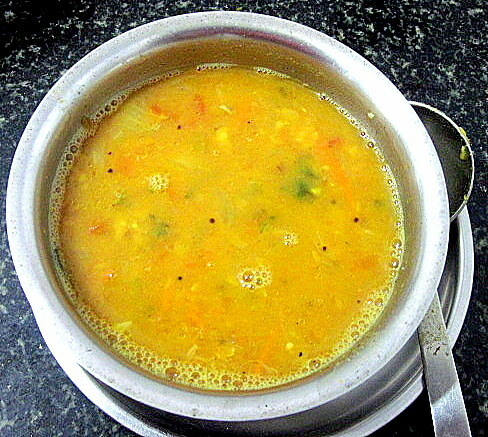 The A2B sambhar caught me. Waav, thanks Chitra. Photos look fabulous to me Chitra tasty and delicious. Wow lovely sambhar chitra. Looks yummy. AAB has sambar powder too??? Sambar looks great. AAB has Sanbhar powders too??? Wow thats interesting.Looks wonderful. Thats such a satisfying meal! Arisi upuma and that sambar makes me drooling. U are so good at trying traditional foods. Carrot boli looks divine. 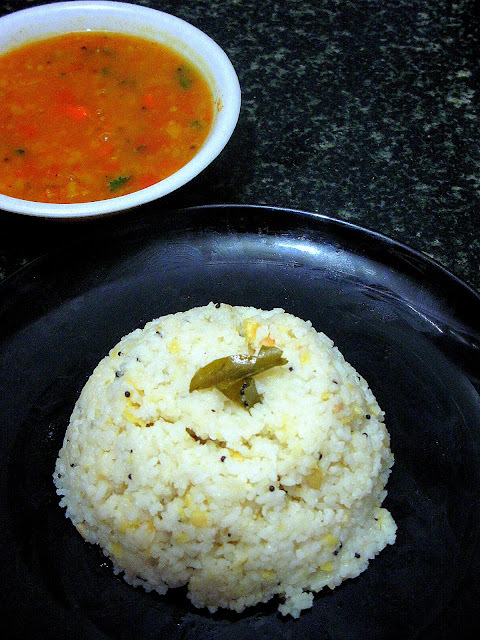 The arisi upma looks delicious and I love that super-quick sambar recipe. Carrot poli has such a fascinating colour. Thanks for stopping by.. I have added you onto my blogroll! Hope you dont mind! You have an awesome collection.. I'll try some soon! What a flavorful sambar ..I wanted to make it with arisi upma but changed my mind in the last min and paired with kuthiravali upma (from ur space too) .. It was a delightful combo. Thanks for the recipe.